It's about that time of year when all of the Team basketball shoes start showing up on the internets. 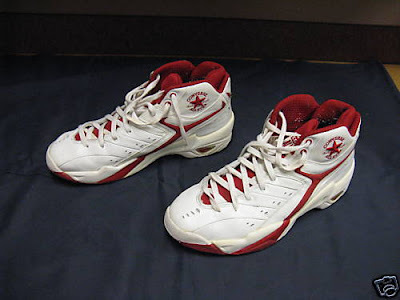 So I thought I'd take a look back at a team shoe from Converse. The Converse Legend was a team shoe in the late 90's...it's either in 97 or 98, I'm leaning more towards 98. I know someone out there knows for sure, right RJ? You should notice a resemblance to the classic Converse Weapon with the modified Y bar support. 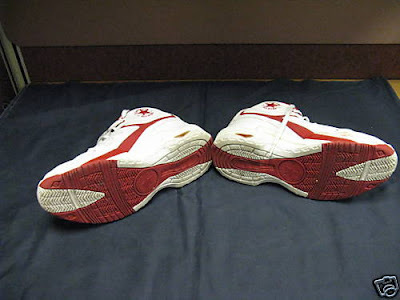 These shoes also featured extra padding around the ankle similar to the All Star 2000...which now makes me lean more towards a 97 release for these. One of the more interesting details about the A/S Legend is that it was the last Converse shoe that Larry Bird was attached to. There was a special white/green/black colorway of the Legend that featured Larry Bird's signature instead of Chuck Taylor's signature on the logo. I'd really love to find a good picture of that shoe, anyone? In the days since the departure of "him who we do not speak of" I've heard different people say that they would like to see Converse reach out to Larry Bird and Magic Johnson and bring them back in the fold on some level. I've been wishing this would happen since the first time they brought the Weapon back a few years ago. Who knows, maybe someday they'll actually be able to advertise the Weapon with Bird and Magic again. I've got my fingers crossed. Actually your right they came out around 1997 and I had the Bird ones those you could only get in the Boston area. Good, sometimes the years all run together haha. I figured that they were Boston area exclusives, but I'd only ever seen one set of pictures on them so I wasn't for sure if they ever actually got produced. Thanks! I have an unworn pair of the Bird one's I bought brand new in 1998 or so. I have pictures if you want to see them...any idea about their value?